1 vegetable stock cube, crumbled into 200ml boiling water and stirred. Preheat the oven to 200°C/ 180°C Fan/gas 7. To make the breadcrumbs tear the bread and place in a food processor and blitz for a few seconds until the bread resembles fine breadcrumbs. Alternatively finely grate the bread. Place the breadcrumbs plus the remaining meatball ingredients, except the oil into the bowl and mix well until the ingredients are combined then using your hands shape into 24 equal sized balls about the size of a walnut. Set 12 balls aside to freeze and place the remaining balls on a lightly greased shallow non-stick roasting pan. Brush the balls lightly with oil and bake for 20 minutes until cooked through. Meanwhile to prepare the Boston beans heat the oil in a non-stick saucepan and gently fry the garlic, onion and pepper for 5 minutes until softened. Sprinkle over the smoked paprika and cook gently for a minute then add the BBQ sauce, baked beans and half of the stock. Simmer gently for 10 minutes, adding the remaining stock if the sauce is thick. Remove the meatballs from the oven and add to sauce, stirring gently until the balls are coated in sauce. Try serving with crispy potato wedges, rice, pasta or bread. This dish also makes a great topping for a jacket potato. If you don’t have wholemeal bread you could use white bread. If you have vegetables such as peppers, courgettes and aubergines that need using up, try chopping them into small cubes and adding to the mix at the same time as you fry the onions. 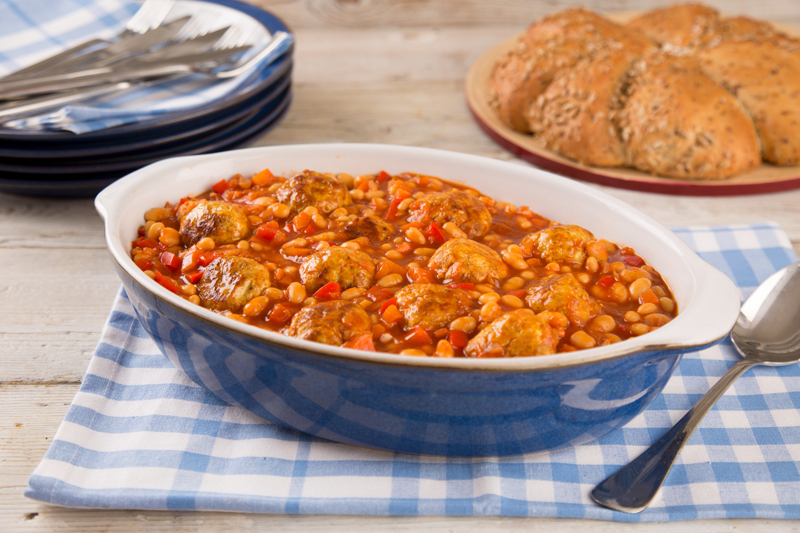 Vegetarian Options The Boston beans are suitable for vegetarians just add ready -made vegetarian meat free balls. Freezing and Storage Tips Freeze the uncooked meatballs in a freezer box between parchment paper then defrost in the fridge and use within 24 hours, cook as detailed above. Boston beans can be frozen but are best eaten freshly made. If you don’t have a freezer you could cook the meatballs in one go and store in the fridge for up to two days, alternatively you could halve the recipe for the meatballs.